Neutrally charged hydrogen and helium atoms form. The continuous scattering of light ends. Photons of light escape freely into space, creating the cosmic microwave background. The temperature of the background radiation is 3000 K, or 2700 oC. At about 380 000 years after the Big Bang, the Universe has cooled down to the stage that the electrostatic interactions overcome the kinetic energy of the particles. Now the protons and the alpha particles, i.e. the atomic nuclei of hydrogen and helium, are combined with electrons; excess electrons are annihilated by collisions with positrons. The energy contents of the matter and radiation are now in balance. The temperature is now 3000 K, or 2700 degrees Celsius. The particle content of the universe becomes thinner, the light scatters from the particles for the last time, and the Universe becomes transparent. From the last scattering, the microwave background radiation is formed. It is born as deep red glow. Now-adays it is no more visible by eyes, but can be detected as microwave radiation in all directions of the sky. It has cooled down to the temperature of 2,75 K, or -270 C degrees. It is very difficult, if not impossible to make any astronomical observations of any events that are older than this. 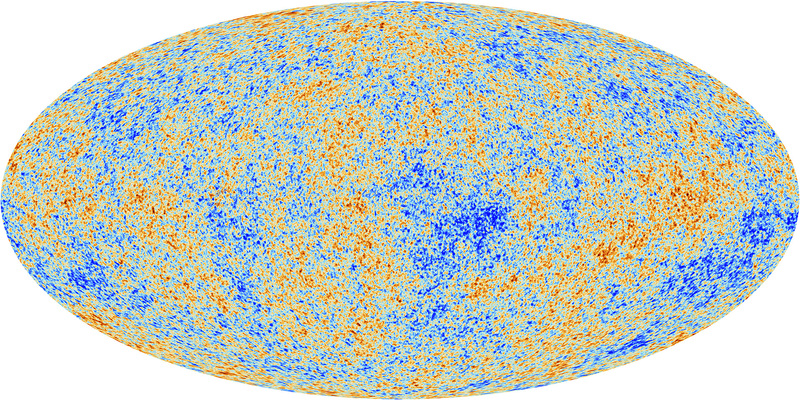 The cosmic microwave background was discovered, by accident, in the year 1964. US scientist, Arno Penzias and Robert Woodrow Wilson pointed an antenna at the sky and noticed that they had some extra radiostatic in their observations. In Turku, you can listen to the static form of the cosmic microwave background. The statue by Markus Copper Big Bang Echo, at the university main campus, has a speaker where 1 % of all the audible voice is from the Big Bang. The statue is the ending point of the Time Trek.